I don’t know about you but if I could eat chocolate with every meal, I absolutely would. Well, if I could control myself and eat just one serving at a time… and not suffer the unpleasant GI symptoms of a chocolate overdose thereafter, I totally would. That’s why I’ve created the ultimate delicious, creamy (but actually cream-less), decadent breakfast… or dessert. No really, it works for either. While I’m certainly a self-proclaimed chocoholic, I always choose my ingredients consciously and wisely when creating a recipe. After all, I’m a dietitian not a chef, so it’s important to me that each ingredient is making a healthful contribution to the final product. 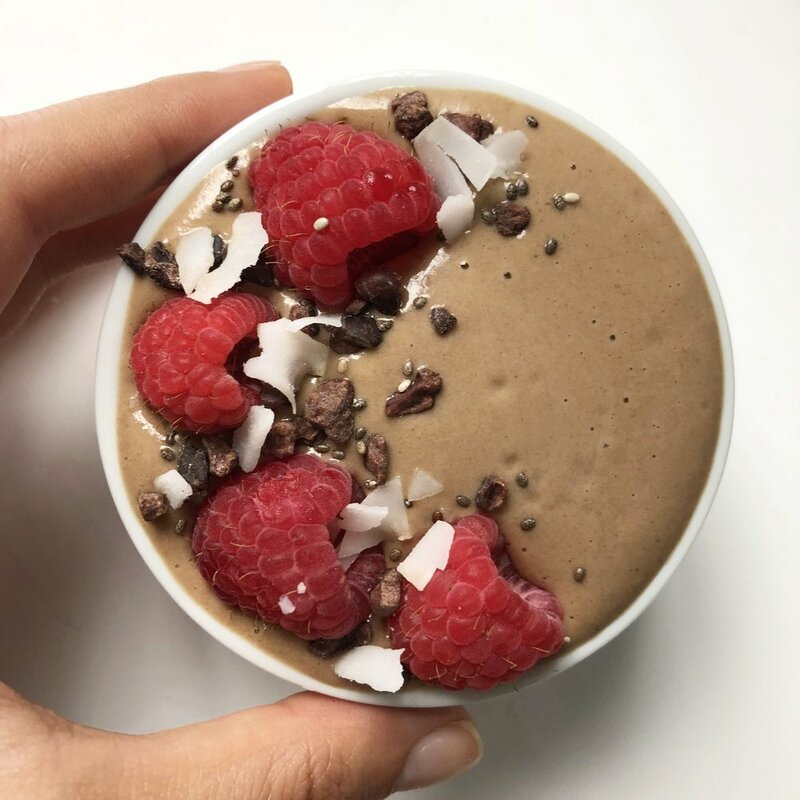 This pudding is essentially an organic blend of avocado, cocoa powder, banana, raspberries, soy milk, vegan vanilla protein, and spices. It’s rich in fiber, healthy fats, and choc-full of antioxidants - especially the flavanoids from cocoa powder. I use organic soy milk because there are tons of health benefits (including antioxidant benefits - though this topic should be it’s own separate blog post) to organic soy, it adds a little protein to an otherwise low-protein dish, and it tastes downright delicious. So here’s my recipe, I hope you enjoy it as much as I do! Combine all ingredients except for the raspberries (and any other desired toppings) in a blender. Blend on high for about 30 seconds, or until ingredients appear mixed and uniform. Contents should be smooth. Separate pudding into different cups for serving. If you’d like to eat a colder pudding, place in the freezer for 30-45 minutes before serving. Top with raspberries as seen above, and other desired toppings.